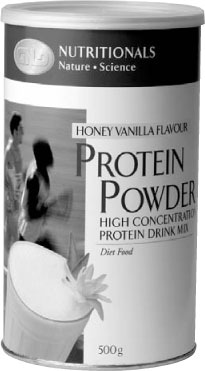 GNLD Protein Powder is a high protein food. A true “product for the family”. GNLD Protein Powder provides an easy, economical and delicious way to ensure that the body receives adequate amounts of high quality protein, which is needed to rebuild worn out cells and tissue. High quality protein containing 22 amino acids involved in human nutrition. Superior taste - Aspartame and fruit sugar. High P.E.R. (Protein Efficiency Ratio). Very low fat, no cholesterol. Low allergy: wheat free, corn free, low lactose. 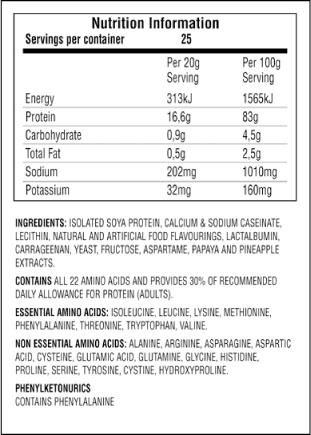 Complete essential amino acid profile assures maximum protein benefits. Isolated Soy Protein, Calcium and Sodium Caseinate, Lecithin, Natural and Artificial Flavourings, Lactalbumin, Carrageenan, Yeast, Fructose, Aspartame, Papaya and Pineapple Extracts. Contains all 22 amino acids and provides 32% of Recommended Daily Allowance for protein (adults). Mix 2 heaped scoops (20g of Protein Powder) with 250ml of milk or fruit juice using GNLD’s Health Drink Shaker or a blender. For an extra treat add some fresh fruit.